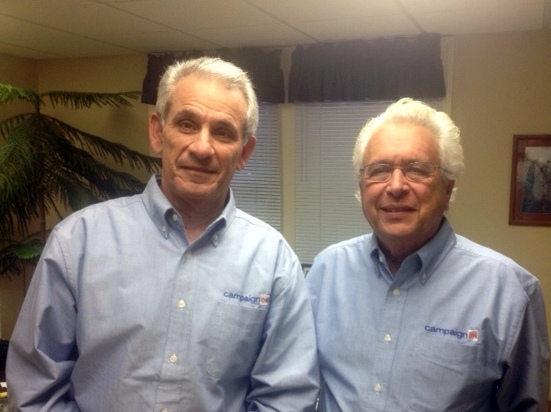 Herb Sweren, left, and Barry Silverman, co-founders of CampaignOn. Herb Sweren and Barry Silverman worked in political campaigns for years as an avocation, while they pursued careers in marketing and advertising. But a couple of years ago, after working together on a Baltimore County campaign, they decided to put their professional skills and political experience into a business using the latest technology that could improve the ground game for state and local candidates. This year they launched CampaignOn, which offers a package of software services that helps candidates identify voters, stay in touch with their supporters, get out the vote and track donations. On a national level, the get-out-the-vote efforts of the 2012 Obama reelection campaign assisted by technology and social media was considered a major factor in its success. “We didn’t think there was a business model that put all these things in one affordable package” for state and local candidates, said Sweren, who spent years in tennis industry marketing and played roles in a number of mostly Democratic Baltimore County political campaigns. “We think we can help get better people elected,” Sweren said. Silverman spent the bulk of his career as a copywriter and media strategist at Trahan, Burden & Charles advertising agency, and helped create media campaigns for many accounts, including races for state and local office. Their clients include both Democrats and Republicans, among them Harford County Executive David Craig’s campaign for governor. Sweren runs the firm as president and CEO, with Silverman as vice president for media strategies. Other partners in the venture include lobbyist Dennis Rasmussen, a former Democratic Baltimore County executive and state senator who provided office space in Towson, and Bob Infussi, who was chief of staff for Rasmussen, district director for Republican Rep. Bob Ehrlich and then worked on his successful campaign for governor. The basic package from CampaignOn includes a full suite of technology — strategy mapping, voter canvassing, voter tracking, a calendar and calendar tracking system, custom website design and email marketing services. “It had to be user friendly, it had to be integrated and it had to be cloud-based,” said Sweren, so it could be used on multiple devices from any location. This summer, at the request of clients, they added a package they branded “Donor Monster” to manage donations and expenditures, including triggers for contribution limits and event managing. The “donor monster” allows for seamless upload of information to state reporting software, “a campaign treasurer’s dream,” said Silverman. Candidates and volunteers have long gone door-to-door with print outs of voter lists that show party affiliation and how often the voter has gone to the polls. CampaignOn’s “Voter Monster” brings that paper process into the era of smart phones and tablets, allowing door-knockers to access that information online, and then update it with the voter’s attitude toward the candidate. Craig campaign manager Paul Ellington, who has been a campaign consultant and chief of staff to Lt. Gov. Michael Steele, said he used other campaign software in the past, most of it national in origin, sometimes from the Republican National Committee. He was also familiar with commercial campaign software vendors such as Aristotle and NationBuilder. “They’re reasonably priced and seemed to offer more services,” Ellington said. According to the price list on the CampaignOn website, single district campaigns on tight budgets can just buy the technology for a one-time $995 set up charge and a $349 monthly fee. That would cost about $5,200 for a 12 month campaign. For a statewide race, the total package would cost about $14,000, including professional consultation on messaging and advertising. Jahantab Siddiqui was field director for Howard County Executive candidate Ken Ulman in 2006 and for U.S. Sen. Barbara Mikulski in 2010, as well campaign manager for Rep. Dutch Ruppersberger last year. He’s seen the evolution of campaign software from Excel spreadsheets on a single PC. “CampaignOn is really a good one-stop shop for all the data storage needs that a campaign has,” Siddiqui said. This year, Siddiqui is helping with Nick Stewart’s race for one of the three open delegate seats in District 12. Del. Warren Miller wasn’t familiar with CampaignOn, but because of his background in IT, he prefers to set up his own voter list, buying the data directly from the local elections board. “It helps you target who are going to show up and vote,” Miller said. The Maryland Republican Party provides its candidates access to voter lists and the GOP data center free of charge, said executive director Joe Cluster. The state Democratic Party provides voter information called MD Van, part of NGP Van, a national firm that supplies an array of software similar to CampaignOn to Democratic candidates, chiefly those running for Congress or statewide office. The party charges for the service, said executive director Bob Fenity. With over 500,000 state and local elected officials in the United States, CampaignOn hopes to take its product into other states. It already has a client in a West Virginia congressional race. It is also developing other products for office holders once they’ve won their campaigns. It was the coolest Tawes Crab Feast in memory. The political-social event of the summer in Crisfield on the Lower Eastern Shore is usually a scorcher in the 90s, but Wednesday was in the low 80s with cool breezes off the bay and low humidity at least at the outset. There was a peculiar lack of candidates this year, perhaps due to the June 24 primary that eliminated many of them. Here’s a photo gallery of some of the folks who did show up.